Max “Blessed” Holloway met Dustin “The Diamond” Poirier in the second of two interim title fights at UFC 236. 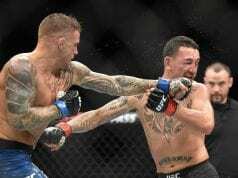 Although he already holds the featherweight title, Holloway (20-3) looked to capture the interim lightweight title and avenge a loss all in the same night against Poirier. 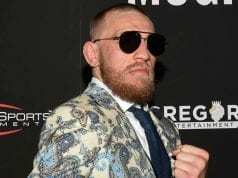 He also attempted to improve upon his ridiculous 13 fight winning streak; a win over “The Diamond” would have made it 14 in a row. As for Poirier (24-5), “The Diamond’s” resumé read like a whos-who of the best MMA has had in the last decade. This title fight was long overdue for Poirier, who had won eight of his last nine in the Octagon. Poirier pumps the jab to start. He lands a hard leg kick. Holloway lands a leg kick of his own. Poirier lands a left hand, then follows and eats a right from Holloway. Poirier goes in for the kill, unloading a barrage of punches. Holloway answers with a right hand. Holloway is hurt. Poirier lands a knee, then wings a right hand. Again, Poirier lands a left hand. Holloway lands. Poirier lands a combo that ends with an uppercut. Holloway lands a left hand over the top. Poirier lands a one-two. Holloway throws a head kick as the round ends. Poirier throws a head kick to start the second round. Holloway lunges in with a right, then gets out of harm’s way. He digs to the body, then goes to the head of Poirier. Poirier wings a left. Holloway switching stances back and forth. He goes to the body again with a right hand. Poirier lands a straight left hand. Both guys land in the pocket. Poirier looks for a takedown but the Hawaiian stuffed it. He peppers Poirier with some rights and lefts. Poirier lands a left hand, he moves in and Holloway circles out. He lands a right hook on Poirier. Poirier lands a right hook that hurts Holloway bad. The round ends. Holloway lands a couple of quick left hands to start the round. Holloway moves in and eats a left hook. Poirier digs to the body. Holloway blitz’ forward with a one-two. Poirier uncorks a right hand. Holloway lands a straight right hand, then gets his jab going. Halfway through the round. Holloway picking it up here, he lands a jab. Poirier lands a right. Holloway wings a left hand then an uppercut. Holloway starting to put the pace on. He throws a flying knee, Poirier catches him and works for the takedown. Holloway defends with hard elbows to Poirier’s head. The round ends. Holloway lands a straight right to start the round. Poirier shoots a takedown and gets deep. He works to complete it as Holloway defends. The fighters grapple and Holloway lands a knee to Poirier’s body as they break. Poirier pops the jab, Holloway is putting it on. He closes in with a right hand, then a left. 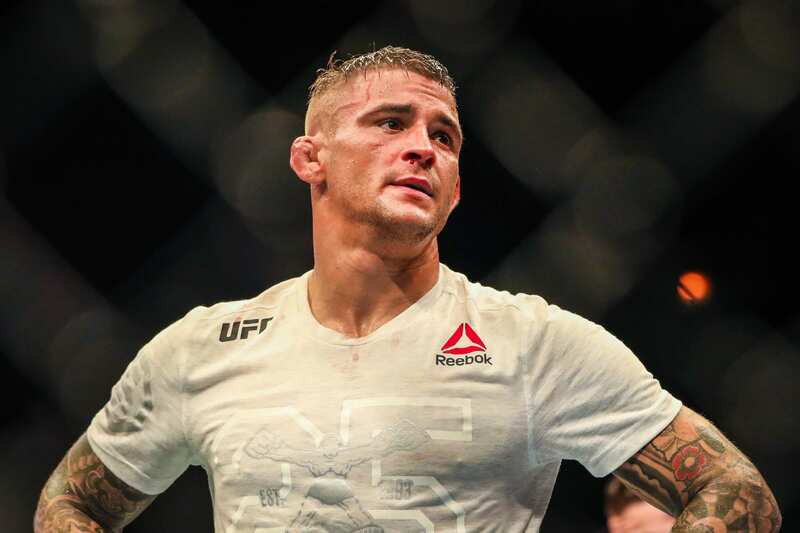 Poirier answers with a right that hurts Holloway. Both fighters unload against the cage. Holloway digs to the body of Poirier. Poirier wings a right. Poirier lands a knee that busts the Hawaiian open. Holloway is having a hard time seeing because of the blood. Poirier looks for a takedown, Holloway thinks about a choke but there is too much blood. The round ends. The fighters throw their jabs to start. Holloway throws a body kick. Poirier goes over the top with a left hand. He cracks Holloway with a counter left. Holloway lands a right as he moves forward. They trade right hands. Holloway lands a body kick. He moves forward and clips Poirier. Poirier catches Holloway on the reset. Holloway works a combo, Poirier answers with a jab. Under two minutes left in the fight. The fighters clinch, Poirier works for another takedown. Holloway defends as both men are taking a bit of a breather. 45 seconds left Poirier still looking for the takedown. The horn sounds.